Happy Thanksgiving! This morning was kinda weird for me. Maybe its because I am due for my period… who knows! But as I was driving up to the Dana Point, CA 10k Turkey Trot, the sun was shining, the ocean was glassy, and I just started to get watery eyes. I have so much to be thankful for. I was just thinking to myself how this was going to be the first race since I found out I got in to Ironman. Which….. though it is a year away….. kinda cool to say. I have a very strong body that I am very thankful for. It helps me endure miles on miles. We should all be thankful for the bodies we have and the health and strength in our extremities that let us race and do the things we want. I have 3 people, besides my immediate family, that I am particularly thankful and grateful to have in my life. My best friends Becca (now lives in France), Erin (in Carlsbad), and my husband Josh. These 3 people have made me really believe in myself over the past few years, and even more so as I start to tackle this race journey. Many of you (well, I know not many are reading.. LOL) may or may not know that I actually do not have support from my parents on my decision to race. They actually HATE that I do endurance races. Sadly.. it kind of fuels me to work harder and do better. But.. Erin, Becca, and Josh, all have been RIGHT by my side, no matter how near or far, and encouraged me, loved me, pumped me up, motivated me (even sometimes they think I motivate them). They are unbelievable people to have as friends. If you don’t know them, you need to. They will make your life better. The texts, the emails, phone calls, just to check in, say hi, catch up, see how training is, and hold each other accountable for working out.. is more than anyone I know. My hubby is a different story, but still love him to death. He knows the races and him have a LOVE/HATE relationship. He loves the way races make me feel (inside and out), but hates how much time it takes and how hard it is on me sometimes. But.. he knows me… and he knows that when I set a goal, I will do it. And when he tells people I am doing an Ironman.. he kinda has a little pep in his voice.. and though he doesn’t do the cheerleader thing with me, or get overly excited with me about it, I know he is kinda proud. This wasn’t really about anything, but being thankful. Being happy. Having a great day and loving the people around me in spirit and in person! I heard this saying in a meeting, “Own Happiness”. I think we should all embrace it. Practice peace, and give high fives! XOXO Happy Thanksgiving 2014! I saw a friend post this. So proud of her. Made me really sit and think about what goes in to this race. I just cried. Sometimes, you just gotta. Soak it up. Take it in. Visualize. There are blind people, amputees, etc racing this. I can too. All I did was sign up… and I had comment after comment on Facebook. . . and though it is only social media.. it makes me really excited to know that this many people believe in me. I am about to learn how to believe in myself more than ever. People get really excited and like “wow” when I tell them about IM, but I don’t realize yet what a big commitment this will be. If it weren’t for my friend Erin.. I wouldn’t really have considered a blog… but to be honest.. If I can do this.. anyone can. I was not born a triathlete… so I hope this blog gives you motivation and belief that you can do anything. I am your average joe… your plain Jade… just pushing to the limits. And, well…. eating a lot along the way! Holy $h*t! I couldn’t believe I signed up for one of the worlds hardest races. I barely ready the subject of my confirmation e-mail that said: “congratulations…” and I started hyperventilating. . . then crying. . . then panic mode set. Was I REALLY ready for this? I called my husband several times, but he didn’t pick up his phone due to a golf date with his father. After a little bit of alone time with the dog and some fresh air… it sunk in. I am going to embark on a journey to become an iron(wo)man. I don’t know how often I will blog (hopefully at least once a week), but I want to share my journey. I want everyone to know that this wasn’t something I had dreamed of my whole life. This is something that only started a little over a year ago. I had a foot surgery that stopped me from running. I became an endurance runner in 2005. I was NOT a swimmer or a biker. After my foot surgery, I was only allowed to swim. For a few months I figured out on my own how to swim. Then I got promoted to the spin bike. That was super fun. However… it wasn’t running. This whole time in physical therapy I was talking with the docs and aids about triathlons. A friend recommended a coach and I said sure. The challenge sounded fun. So in July of 2013 I took on my first sprint tri in Carlsbad. I hated it. It was SO short. A half mile swim, a 12 mile bike, and a 3 mile run. It took us longer to drive their than it did to do the event. After that… I was like ok.. I am an endurance athlete, I need bigger. So I told my coach I was going to do a half ironman. He was shocked. He wanted me to do more little races and prep myself. I was barely swimming properly and hated the race… he didn’t understand. And Neither did I. 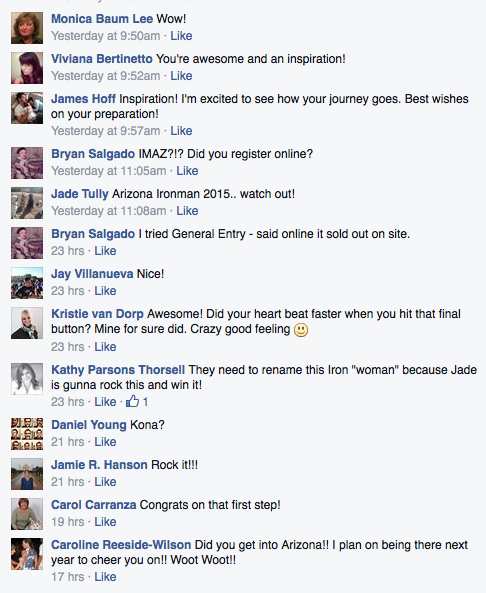 In November 2013, in Tempe, AZ., I took on a 70.3 half ironman race. the training was tough, but doable. The race was miserable. Hot, bleeding lips, loops on the bike and on the run… WHAT WAS I THINKING??!! I don’t know… but I did it, and I was SO SO proud of myself. Someone who said they would never and could never complete some race with a swim, bike, AND a run did. It taught me some discipline, and such, but I needed more. I don’t know. So months have passed and I have debated if I was ready to consider a full 140.6 mile ironman. A few more weeks and I was HEAVILY visualizing (I do that best) about finishing a full, about the trials and triumphs of what training would be like. I watched YouTube videos of past events and I would cry. I would cry because I want to know that feeling. I want to know that pain, the glory, the thrill. I want the title.. the medal. The respect. And so.. I am where we are today. 1 year EXACTLY away from my first full ironman. It will be 2 months of getting my body in shape to start training. Then I will embark on a 10 month rigorous training to get ready to do the race of a life time. I hope you enjoy my journey with me. I hope I see some of you at the finish line. I hope some of you will support me and help me and encourage me along the way. I am sure this is more than a training for a race. I am sure I will learn a lot about myself, my emotions, my strength, and more. I can’t wait to tell you about it. . . until next time!